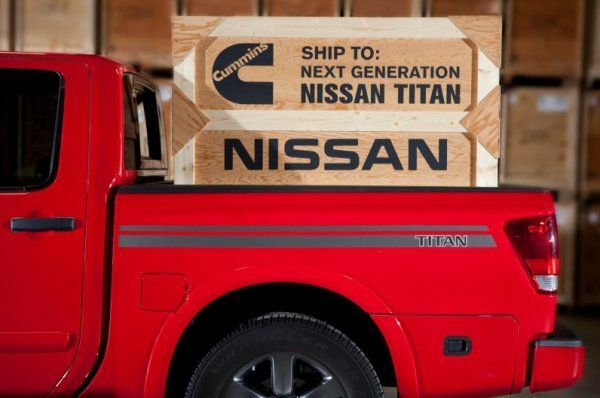 When Nissan announced that a huge V8 diesel engine from Cummins would be offered in the next-generation Titan pickup truck, the automotive press went wild. The announcement (read about it here) was met with commentary like "overpowered for a half ton" from a bewildered press. Even I stepped onto that bandwagon, speculating that the 300+ horsepower, 550+ lb-ft turbo diesel was too much for a mere half ton pickup truck, but was instead just a test bed for a future heavy-duty offering (read that here). With the release by Cummins of information on the engine itself, which you can read here, I decided to find out what is going on with the Titan Diesel. I contacted a friend and press representative at Nissan to get the skinny. He put me in touch with a spokesperson for the next-generation Titan. In an interview, we learned the impetus behind putting such a seemingly large engine in the half-ton truck. When asked about the information from Cummins on this engine platform, Nissan made sure to clarify that the Cummins release was for the engine platform for commercial use and did not list the specifications Nissan had laid out for the engine to be used in the Titan: "To be clear, what they announced is the information on their commercial side. The details and specifics for the Titan engine have not yet been released." This explains the horsepower difference between what Nissan has specified for the Titan Diesel (300+) and the Cummins release (up to 275). The first question I had for the Titan representative was what the customer profile for the Nissan Titan Diesel with a V8-powered, 5.0-liter engine putting out 550 lb-ft of torque would be. This is where I learned that all of my assumptions had been wrong. The truck is aimed at a market that is not being exploited, one that falls between the half ton owner and the heavy-duty, 6.7-liter, 800 lb-ft owner. "I think you're pointing to a specific target customer, but as you're aware," said Nissan, "the full-sized pickup truck customer is as varied as any segment. You have everyone from the weekend warrior to the dedicated work customer and our application is not necessarily [aimed] at one specific customer for this. We've heard for years and years, as most other manufacturers have, that customers have wanted a diesel engine in a half-ton pickup truck. So we set out to really explore what are the opportunities for putting a diesel engine in our Titan pickup truck. To highlight a specific customer would be misleading because we're talking about customers that are in the north, plowing snow, and in the south, pulling hay, or using it for equestrian purposes, or on a construction job site. And everywhere in between. It's a varied market, but the demand is there. We think that this unique package will appeal to all types of customers." When questioned about why this would be the choice over the smaller V6 at three liters to be offered in the Ram 1500 next year, he responded that the Titan offering hits an untapped market in between the mid-range standard half ton and the heavy-duty customer who needs the large 6.7-liter power plant. Considering the market and talking to some neighbors who haul mid-range loads, I can now see what Nissan is aiming for with this V8 turbo diesel. The engine in the Titan Diesel will be more than 300 horsepower, about 550 lb-ft of torque, but Nissan has not made announcements on the full specifications, powertrain, and other options. As for my speculation that Nissan is aiming for the heavy-duty vehicle market, Nissan says they cannot yet comment on that. "At this point, we haven't announced any plans for that, so I couldn't comment on whether we have plans for that," I was told. "As you mentioned, we have a very successful line of light commercial vehicles: our van, the Titan pickup truck, and we're very committed to the Titan in the next-generation.. but we don't have any plans to announce on plans for a scale up of the Titan pickup truck." So there you have it. Torque News would like to thank Nissan for taking the time to answer our questions and clarify the upcoming Nissan Titan Diesel for us and our readers.